Great Guana Cay is the longest of the Abaco Cays, famous for its stunning ocean beaches and the colorful reef that extends the entire length of the island. This is one of the most popular destinations for our crews and with the awesome barrier reef just offshore, Great Guana Cay offers unparalleled Scuba Diving and snorkeling opportunities. 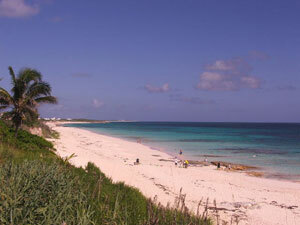 In recent years Guana has become an increasingly popular tourist spot. Visitors usually head straight for the world famous Nippers Beach Bar and Grill where breathtaking views of the Atlantic Ocean and beach below come at no extra charge. This is a perfect place for you to swim, snorkel, picnic, relax and take in the beauty of the island. Many crews anchor or take a mooring in the protected Fisher's Bay or Settlement Harbour before going ashore to explore. Fisher's Bay is home to numerous magnificent Eagle rays and Green Turtles so it's well worth snorkeling in the bay.